Sun, sea and swimming, snoozing on deck while the turquoise sea whispers under the keel… this may just be the most relaxing Med holiday you’ll ever enjoy. The Gulet SUDE DENIZ sails out of Marmaris (ideal for combining itineraries to Greece or the Datca Peninsula with the marvellous Hisarönü Gulf. The Turkish crew takes care of everything from steering to cooking and hosting on our behalf, though BLUE CRUISE meet you at the airport or harbor and see you settled in on arrival. 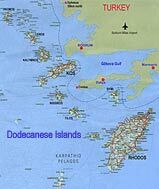 The week’s cruise – mostly powered by the reliable engine, though with at least two periods ‘under sail’ – takes in tiny islands, hidden coves and pretty fishing ports. Each day falls into an easy pattern of breakfast on deck, reading and sun-bathing while the boat sets sail, dropping anchor for swimming and snorkelling before lunch; cruising again in the afternoon and dropping anchor in a safe harbour each evening. This is a wonderful way to unwind, get a great tan and explore Turkey’s astonishingly beautiful coast in good company! is considered to be among the finest in the world. On board the M/S SUDE DENIZ you will find the finest Turkish dishes, prepared using the freshest vegetables, fish and meats. Our cook is an expert in his field. He will pamper you with three meals a day: breakfast, lunch and a three-course dinner in the evening. If you have any special dietary requirements (if there are certain foods you dislike or mustn't eat), simply let him know. He will be able to prepare dishes to suit your exact taste. Your meals on board: there will be Fullboard (3 meals + teatime) price € 32,- per person/per/day. Soft Drinks and alcoholic drinks are extra, we can buy them at supermarket prices and you just pay us the bill plus a service-extra for the crew of only 10%: We think that's a fair offer and all previous guest did appreciate that very much. There is nearly none of the gullet charter-companies who tells you the truth about the use of air-conditition on Gulets. 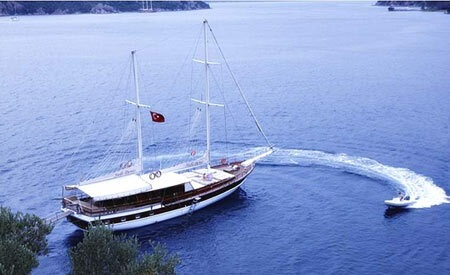 Yes, M/S SUDE DENIZ has AC and you switch it on indivually. But on a boat the AC can only run when the generator is on, or in a harbor when connectet to 220 Volt. Mainly you are in anchorbays, often next to a neighbor, who doesn't like the noise of your generator and you wouldn't like it either during the night for example. komplette Navigationsausrüstung nach internationalem Standard einschl. Kompass, Log, Lot und VHF, Rettungsinsel, Schwimmwesten, Feuerlöscher, Rauchmelder, Schlauchboot mit Außenborder. Telefon, hydraulische Ankerwinsch, 2 Anker, Klimaanlage, Kühl- und Tiefkühlschränke, Icemaker. And of course like all our boats, the M/S SUDE DENIZ meets international safety regulations including life jackets, fire extinguishers and alarms.